IDF strikes Hamas positions in northern Gaza in retaliation for rocket fire on Ashkelon. 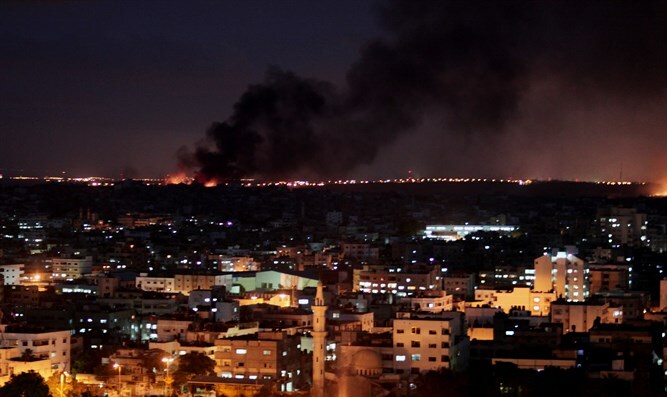 The IDF on Monday night attacked positions belonging to the Hamas terrorist organization in northern Gaza, the IDF Spokesperson’s Unit said. The attacks, which were carried out using tanks and aircraft, were in retaliation for the rocket fire on Ashkelon earlier. "The IDF considers the Hamas terrorist organization solely responsible for what is happening in Gaza," said the IDF statement. Rocket sirens were heard in the Ashkelon and Hof Ashkelon regions in southern Israel on Monday evening at around 11:30. Shortly thereafter, the Iron Dome anti-missile system intercepted two rockets that fired from Gaza towards the area. No physical injuries or damages were reported. Earlier on Monday, Gazan terrorists fired a rocket into Israel which exploded in the Eshkol Regional Council, near the Israel-Gaza border. There were no reports of physical injuries or damages. Following the rocket attack, the IDF attacked terrorist positions belonging to the Hamas terrorist organization in southern Gaza. On Friday, terrorists in Gaza fired two rockets at Israel. One of the rockets struck a kindergarten in Sderot. No injuries were reported as the kindergarten was closed at the time.